DocuSign enables accountants and tax specialists to get necessary signatures faster than ever, while still meeting strict legal requirements. Now you can turn around documents in hours—not days. Gain critical speed when deadlines are looming. DocuSign lets you send documents for electronic signature, saving time and hassle. No more waiting for clients to print PDFs, sign them, and then return them by fax or mail. With DocuSign, you can turn documents around in hours instead of days, so you can focus on client work instead of on tracking documents. Use secure authentication to protect you and your clients. With today’s rampant identity theft, we’re all concerned about privacy and security. Your customers want the assurance that their documents won’t be shared or stolen and that their signatures can’t be forged. DocuSign’s digital transaction management lets you send documents electronically, instead of leaving them sitting in the mail or on the fax machine. And our secure authentication helps protect against fraud. Give your customers the modern experience they expect. DocuSign lets your clients receive and sign documents on their computers or mobile devices. The process is simple and streamlined, so you can provide your customers with the best service possible. Ensure that you and your clients are in compliance. Your business is all about saving your customers money while keeping them compliant with federal and state regulations. We meet the latest IRS regulations, ISO 27001 and SSAE 16 standards, and more. Plus, when you use DocuSign, your documents are saved electronically and retain an audit trail for added transparency. Save time during the busy tax season with secure electronic signing. 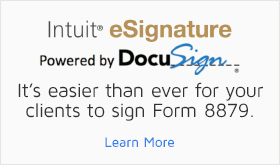 Intuit has partnered with DocuSign to offer Intuit eSignature. Now, you can send and sign IRS Forms 8878 and 8879 electronically—right from your Intuit product. DocuSign ensures compliance with the latest IRS regulations for e-signing. And it helps prevent identity theft by securely sending encrypted documents and using authentication to verify the signer. When you use Intuit eSignature , it’s faster and easier for you and your clients to sign tax documents. And DocuSign provides an audit trail and keeps a copy of every signed document, making it easier for you to follow up or to reference documents later. Have an Intuit product? Start using DocuSign from the product. Need DocuSign for more than Form 8879, or have more than 10 users?